AceThinker Screen Grabber Pro is an easy-to-use but versatile desktop program for recording any screen activity happening on your computer. It can capture screen along with audio from the system sound, microphone or both. The recorded video can be saved in popular video formats like WMV, AVI, FLV, MP4 and more with no quality loss. What’s more, the built-in video editor allows you to annotate and enrich your recording in real time during the recording process. 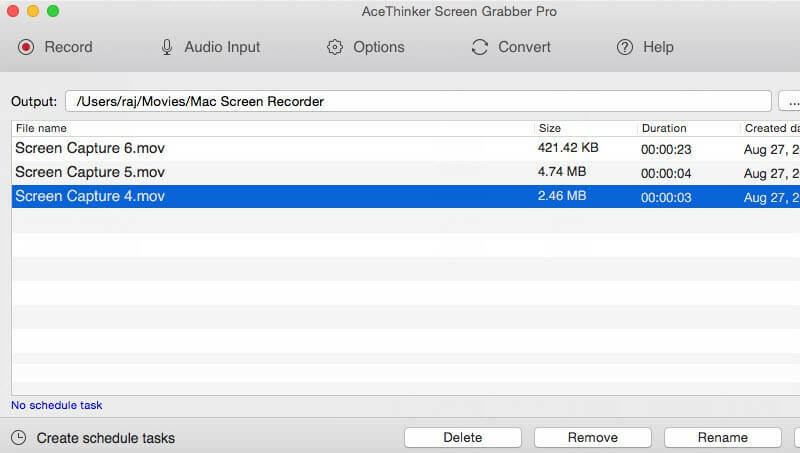 Here is a quick walkthrough of the main features of AceThinker Screen Grabber Pro. Capture Screen in Multiple Modes: Screen Grabber Pro offers different screen capturing modes to suit different situations. You can record the full screen, any region of the screen, or only the part around the mouse cursor. What’s more, it enables you to record video from webcam so you can easily achieve a picture-in-picture effect or record your online webcam conference. The option to record only audio is also provided. Record Screen with Audio Synchronously: Apart from choosing from the multiple recording modes, you can also select the audio input for the screen video recording. That means record the audio activity at the same time when you’re making the screen recording. You can set the audio input from system sound, microphone or both according to your needs. The video and audio will be recorded in high synchronization. Save Recorded Video in Various Formats: Now you don’t need to worry about the video incompatibility issues on different platforms as this screen recorder lets you save the recordings into any widely used format, including AVI, WMV, FLV, MOV, MP4, MPEG, 3GP, GIF, etc. Plus, you can customize the video bitrates, frame rate, mouse cursor and more. And you can even upload and share the video to FTP or YouTube immediately. Make Real-Time Editing When Recording: Packed with some basic video editing functions, it allows you to edit and annotate your screencast in real time. You can add texts, lines, circles, arrows, rectangles, effects, etc. to your video to enhance and polish the demonstration. This feature is quite useful when you need to create instructive tutorials. Schedule Tasks for Automatic Recording: Another remarkable feature is that it provides a task scheduler to help you capture the computer screen automatically during your absence. You can just preset the start time the duration and when it’s the appointed time, the program will start to record your computer screen as requested. Thus, you can record and monitor screen with no need to be in front of the computer. Take Quick Screenshots of Your Screen: Taking screenshots is also possible with Screen Grabber Pro. It allows you to capture any area you want by dragging the mouse cursor to choose the specified part. When snapping, you can also make some basic editing immediately: write texts, add lines, create markers, highlight something, etc. Using Screen Grabber Pro to record your desktop activity is quite easy. You can simply download the program from its official website and install it following the wizard. The programs comes with an intuitive interface that you can quickly get your tasks done even if you’re a newbie. Just choose a capture mode, select the input audio source and set the output video format according to your recording needs. And then click the Start button to start recording video from your screen. When the recording is OK, click the red Publish button to finish the recording and save it to your hard drive as a video file. Thanks to AceThinker’s free giveaway of Screen Grabber Pro, now everyone can get a full version copy for free. Note that the giveaway is a 1-year license which will expire in 1 year while the purchased ones enjoy lifetime licenses. Visit Acethinker Christmas giveaway/promotion page to get a license for FREE and enjoy up to 50% OFF discounts for Acethinker other products.